Features: The perfect travelling companion this lightweight universal lens clip provides 3 easy to use auto focusing lenses. 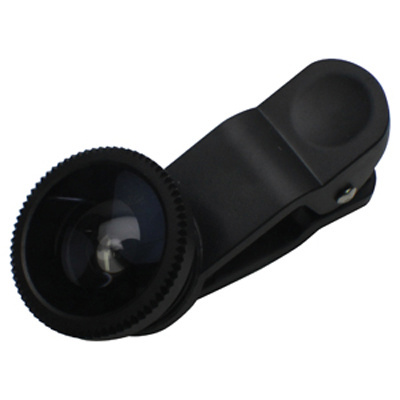 Fisheye for 180 degrees shot, Wide-angle (0.67x) for large range shots and a Macro Lens (10x)for those tiny objects, telephoto lens (2x) Compatible with smartphones and tablets with a camera lens < 13 mm in diameter. Includes lens caps and velvet pouch (85 x 65 mm).. Certification: CE, FCC, RoHS. Product Colour: Black, Blue, Gold, Red, Silver. Product Size: 53 x 22 x 15 mm (clip only). Print Area: 10 x 10 mm. Print Process: Pad print. Delivery: 3-4 weeks (indent) from art approval. Standard Packaging: Coloured Gift box. Packing Details: 100 pcs per carton, 7 Kgs, 36x51x30 cms. Setups: Included.